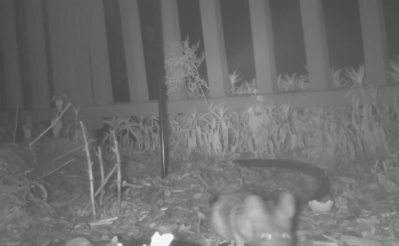 In my last crittercam installment, the NoIR night-vision crittercam, I was having trouble with false positives, where the camera would trigger repeatedly after dawn as leaves moved in the wind and the morning shadows marched across the camera's field of view. 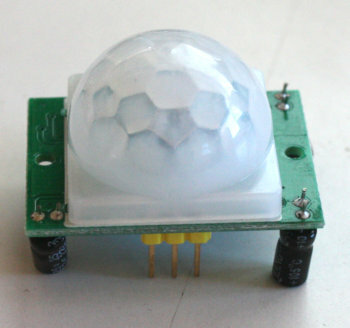 I wondered if a passive infra-red (PIR) sensor would be the answer. I got one, and the answer is: no. It was very easy to hook up, and didn't cost much, so it was a worthwhile experiment; but it gets nearly as many false positives as camera-based motion detection. It isn't as sensitive to wind, but as the ground and the foliage heat up at dawn, the moving shadows are just as much a problem as they were with image-based motion detection. Still, I might be able to combine the two, so I figure it's worth writing up. 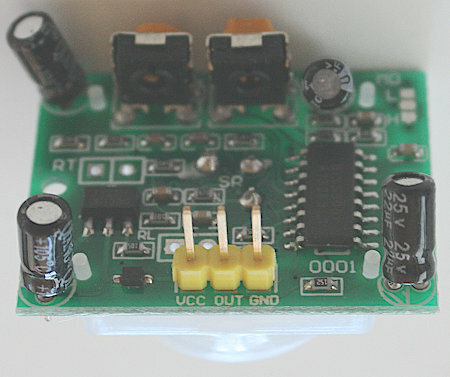 The PIR sensor I chose was the common HC-SR501 module. It has three pins -- Vcc, ground, and signal -- and two potentiometer adjustments. It's easy to hook up to a Raspberry Pi because it can take 5 volts in on its Vcc pin, but its signal is 3.3v (a digital signal -- either motion is detected or it isn't), so you don't have to fool with voltage dividers or other means to get a 5v signal down to the 3v the Pi can handle. I used GPIO pin 7 for signal, because it's right on the corner of the Pi's GPIO header and easy to find. and whenever I walked in front of the camera, it triggered and took a photo. That was easy! So easy that I decided to switch to the more efficient interrupt-driven model. Writing the code was easy, but I found it triggered more often: if I walked in front of the camera (and stayed the requisite 7 seconds or so that it takes raspistill to get around to taking a photo), when I walked back to my desk, I would find two photos, one showing my feet and the other showing nothing. It seemed like it was triggering when I got there, but also when I left the scene. A bit of web searching indicates this is fairly common: that with RPi.GPIO a lot of people see triggers on both rising and falling edges -- e.g. when the PIR sensor starts seeing motion, and when it stops seeing motion and goes back to its neutral state -- when they've asked for just GPIO.RISING. Reports for this go back to 2011. On the other hand, it's also possible that instead of seeing a GPIO falling edge, what was happening was that I was getting multiple calls to my function while I was standing there, even though the RPi hadn't finished processing the first image yet. To guard against that, I put a line at the beginning of my callback function that disabled further callbacks, then I re-enabled them at the end of the function after the Pi had finished copying the photo to the remote filesystem. That reduced the false triggers, but didn't eliminate them entirely. Oh, well, The sun was getting low by this point, so I stopped fiddling with the code and put the camera out in the yard with a pile of birdseed and peanut suet nuggets in front of it. I powered on, sshed to the Pi and ran the motion_detect script, came back inside and ran a tail -f on the output file. I had dinner and worked on other things, occasionally checking the output -- nothing! Finally I sshed to the Pi and ran ps aux and discovered the script was no longer running. I started it again, this time keeping my connection to the Pi active so I could see when the script died. Then I went outside to check the hardware. Most of the peanut suet nuggets were gone -- animals had definitely been by. I waved my hands in front of the camera a few times to make sure it got some triggers. Came back inside -- to discover that Python had gotten a segmentation fault. It turns out that nifty GPIO.add_event_detect() code isn't all that reliable, and can cause Python to crash and dump core. I ran it a few more times and sure enough, it crashed pretty quickly every time. Apparently GPIO.add_event_detect needs a bit more debugging, and isn't safe to use in a program that has to run unattended. Bummer! Fortunately, I had saved the polling version of my program, so I hastily copied that back to the Pi and started things up again. I triggered it a few times with my hand, and everything worked fine. In fact, it ran all night and through the morning, with no problems except the excessive number of false positives, already mentioned. False positives weren't a problem at all during the night. I'm fairly sure the problem happens when the sun starts hitting the ground. Then there's a hot spot that marches along the ground, changing position in a way that's all too obvious to the infra-red sensor. I may try cross-checking between the PIR sensor and image changes from the camera. But I'm not optimistic about that working: they both get the most false positives at the same times, at dawn and dusk when the shadow angle is changing rapidly. I suspect I'll have to find a smarter solution, doing some image processing on the images as well as cross-checking with the PIR sensor.